Ever more over these next days, the eye of the Vatican will be focused squarely on Russia. Come Sunday, the slate of three candidates for the patriarchate of Moscow -- the "supreme post" of global Orthodoxy's largest branch -- will be chosen by its bishops, with the successor of the late Alexei II to be elected 48 hours later by a "local council" of delegates representing lower clergy, religious and laity. While the 15th patriarch of All Russia slowly thawed his once-iron line toward Rome thanks in large part to a concerted, multi-pronged outreach on the part of Benedict XVI, the future of the Vatican's much-hoped for "new possibilities" with both the Moscow church and state -- including the odds for the first-ever papal visit there -- hinge heavily on the church's choice to replace Alexei, who died suddenly in early December at 78. As it was from the vacancy's first moment, however, the widely-perceived leading candidate remains the hierarch who would arguably be the Vatican's favored pick: the patriarchate's interim administrator, Metropolitan Kirill of Smolensk and Kalingrad. Long its top hand on external affairs, the media-savvy 62 year-old's portfolio has made him the Holy Synod's point-man on relations with Rome, a status that's brought him into the papal apartment for multiple private audiences with Benedict over the course of the latter's pontificate. 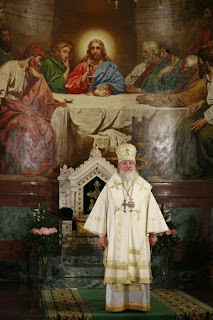 While even the Kremlin is believed to want a patriarch more open to the Vatican, the metropolitan's ecumenical-friendly reputation finds resistance from the church's influential quarters given to Alexei's perception that sees an expanding Catholic presence on Russian soil as tantamount to "proselytism" and an infringement on the patriarchate's traditional preeminence in national life. Russian-language Internet, which has a plethora of Russian Orthodox news sites and forums, has been buzzing about the outcome. 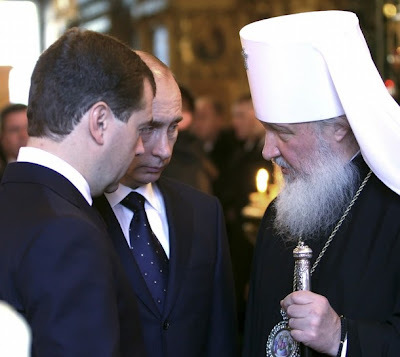 On some sites, where ecumenism is frowned upon, Kirill has become a flashpoint for criticism over his involvement in the quest for church unity. On 31 December Pravaya.ru published an open letter taking Metropolitan Kirill to task for ties with the Roman Catholic Church. The letter asked him to renounce statements it says he had made in the past. First among them, states the letter: "We ask you to disavow the assertion that the Orthodox and Roman Catholic churches are divided parts of One Church, and affirm that in the true sense the One Holy Catholic and Apostolic Church is only the Orthodox Church." The letter cites an interview Kirill gave in 1991, in which he stated that no ecumenical council, similar to those that established church doctrine in the early centuries of Christianity, has been convened since the division of the churches to formally condemn the resulting religions as heretical. In a defence of Kirill published on 13 January in response to the open letter, Bishop Hilarion of Vienna and Austria cited interviews, sermons and documents in which Kirill disavowed the "branch theory" of Christianity. "The goal of branding someone with whom one does not agree as a heretic is not, of course, to find the truth, but to blacken one's opponent," Hilarion wrote. "When this is done on the threshold of a local council that will be electing the Patriarch, and in regards to one of the possible candidates, then it is clear this is not a search for truth but a sinful means of fighting an undesirable person." The delegates named by each diocese to attend the local council, and the process of selecting them have also stirred heated debated. It has been noted that bureaucrats and others with close ties to power, are among the delegates, including the governor of the Omsk region, the wife of the governor of Primorsky Krai, on Russia's Pacific coast, and a number of businessmen. Metropolitan Kirill of Smolensk and Metropolitan Kliment of Kaluga and Borovsk, the Moscow Patriarchate's property manager, who [is] seen as less enthusiastic on church unity than Kirill, are regarded as the leading candidates. Previously Metropolitan Filaret of Minsk had been seen as the favourite, but there are concerns about his health. In recent days new names have also been bandied about on Web sites as alternative candidates, Among them, Archbishop Rostislav of Tomsk, who is praised for his modesty and piety. Ukrainian bishops caused a furore in late December when they said they would support Metropolitan Vladimir of Kiev as a candidate, although candidates are not formally named until the archbishops meet in Moscow. On 17 January at a meeting in Kiev, Vladimir told the Ukrainian Orthodox Church's delegates to the local council he does not want to be a candidate. Some analysts have said this might open up Ukrainian votes at the local council to bargaining in exchange for the church's autonomy from Moscow. Late last month, Kirill sought to assuage conservative concerns by making public assurances of his opposition to church reforms, including the progressive push for the replacement of the traditional Church Slavonic used in its liturgy with Russian vernacular. Earlier this month, the papal nuncio in Moscow, Archbishop Antonio Mennini, attended Kirill's divine liturgy for Christmas in the city's patriarchal cathedral, where the church's 16th head will be formally enthroned on the Sunday following the vote.